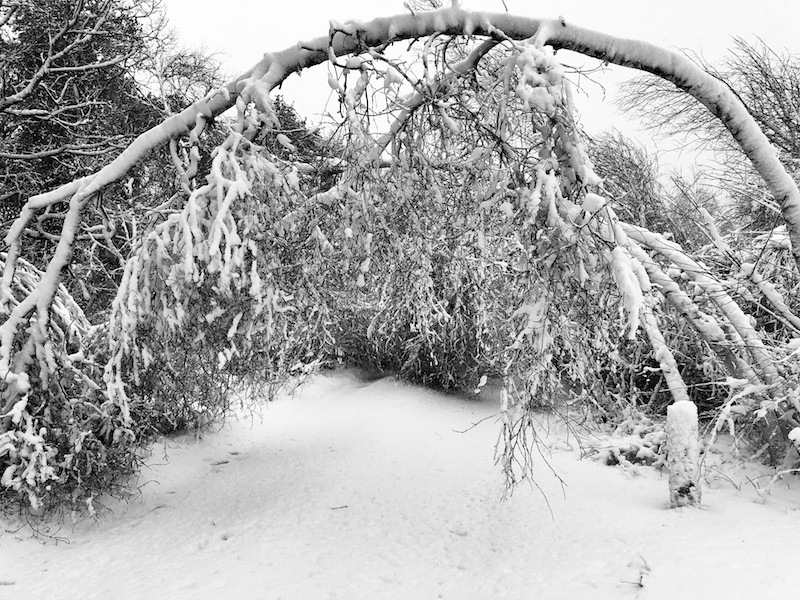 Downed tree on a snowy West Tisbury lane. Blizzard conditions were widespread Tuesday as a third northeaster in nine days battered all of Massachusetts. By nightfall the storm had begun to wind down but overnight shelters opened in Aquinnah and Edgartown, where power outages lingered. The Aquinnah shelter is at the town hall; the Edgartown shelter is at the school. All are welcome. Public schools are closed Wednesday and the Steamship Authority is operating on a trip by trip basis . Driving snow and power outages were the main story of the storm that shuttered public schools, government offices and ferry service for the day. 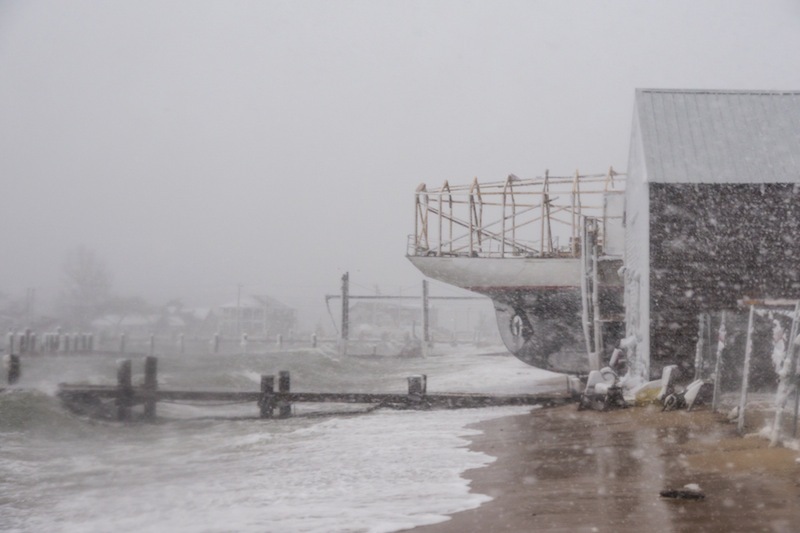 The National Weather Service said blizzard conditions were confirmed on the Vineyard, which means three hours of sustained winds of at least 35 miles per hour along with considerable falling and blowing snow. 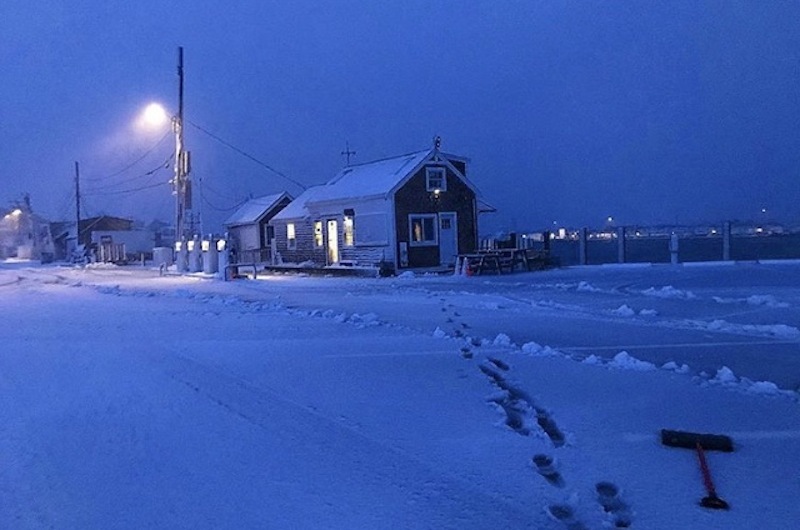 About 5.5 inches of snow was observed in West Tisbury, according to the weather service. Downed trees and power lines were reported around the Island, and police advised residents to stay off the roads if possible because conditions remained unsafe. Power was slowly being restored though widespread outages remained. At 4 p.m. Eversource reported that about 5,300 customers remained without power on the Island, including all of Aquinnah and about half of Chilmark. About a third of the Vineyard remained without power. In Aquinnah officials were preparing for a night without power. In Edgartown, many areas of town were still without power at nightfall. Downed trees and power lines were reported around the Island, and several road were closed because of snow or coastal flooding. 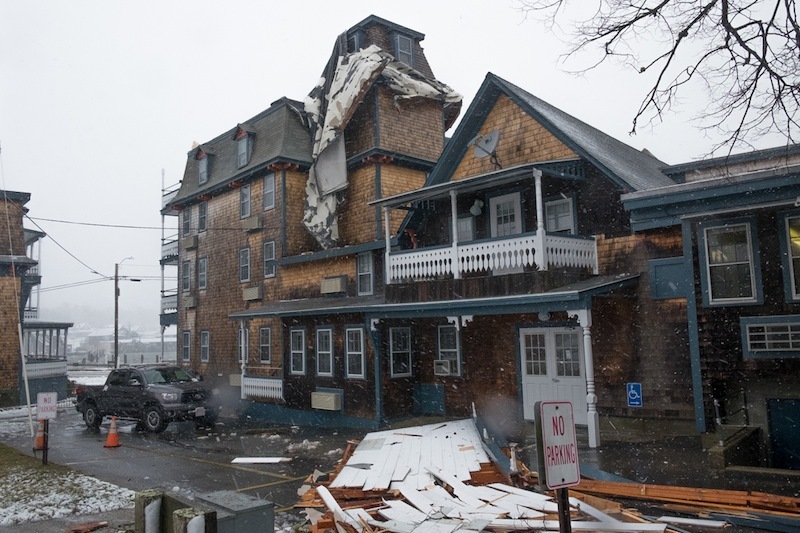 Oak Bluffs police reported that part of the roof had blown off the Summercamp Hotel on Oak Bluffs Harbor. People were asked to steer clear of the area. Main street, Union street, and Spring street in Vineyard Haven were closed to traffic, as well as part of Skiff avenue.In Edgartown parts of Meetinghouse Way and Herring Creek Road were closed. In Aquinnah police said part of State Road by the Orange Peel Bakery was closed because of a downed tree. The Vineyard Transit Authority cancelled service for several routes and cautioned about delays on other routes. Early Tuesday morning a wind gust of 53 miles per hour was recorded in Aquinnah, according to the National Weather Service on Twitter. The storm comes on the heels of a severe northeaster that hit the Vineyard the first weekend of March, causing widespread property damage. More scenes from the storm. Keeping everyone on MV in my thoughts. Stay safe out there! Do you think the Ferry is running? Just kidding. Don't forget to shovel all that global warming off your sidewalks so pedestrians can get through. Hmmm, someone doesn't understand global warming. No, they don't get it! Global warming is exactly why the Vineyard and New England are being hit so hard. The Arctic air is now warmer and this has forced the cold air, and storms, to sit over New England and New York. One does not have to "believe" in global warming, because it's true.